An advanced editor of choreographies with an automatic generator of coreographies and a simulator of the Magic Fountain of Montjuïc helps to generate new choreographies for the Magic Fountain of Montjuïc in an intuitive and easy way. The Magic Fountain of Montjuïc has 3620 different springs grouped in 24 different water games. They can be turned on and off, combining them all. It has 6 light zones with slowly revolving lights, white snapshot lights, psychedelic lights and colored lights at the peripheral area. A PLC situated under the Magic Fountain controls all these lights and springs. An automatic generator of choreographies analyses the musical piece and proposes a water choreography. It makes a perceptual and semantic analysis of the musical piece and establishes mechanisms for mapping between the parameters extracted from the music and the possibilities of the Magic Fountain of Montjuïc: water and light. It incorporates the specific characteristics and performance of the Magic Fountain: delays, latencies, etc. ; and it shows its actual state. Mapping and results are generated automatically but they can be modified and modulated by selecting certain dynamic or color parameters using an intuitive Editor created also specially for the Magic Fountain. 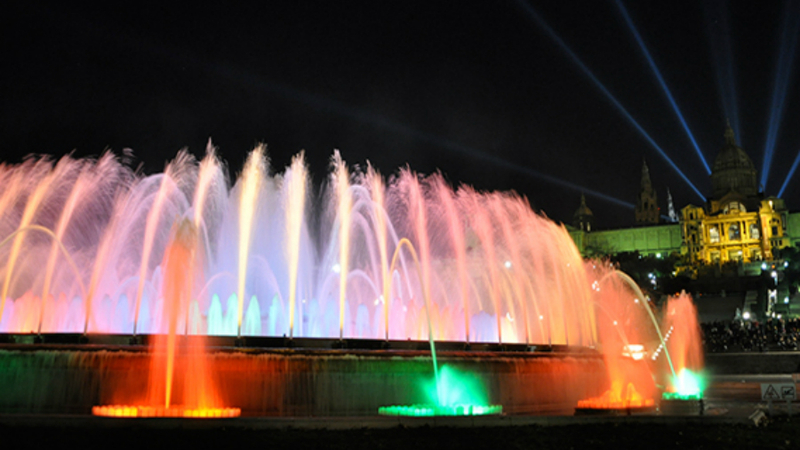 The project is completed with a virtual Simulator of the Magic Fountain which allows the creator to visualize the new choreographies as well as the existing ones in order to make it easier to accomplish successfully and precisely the desired performance of the Fountain, enhancing the captivating effects of one of the major attractions in the city of Barcelona. Client: UTE Fonts, Ajuntament de Barcelona. Tasks: design and production and technology director.